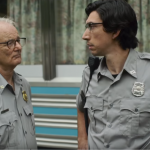 Bill Murray and Adam Driver take on a horde of zombies in the first trailer for upcoming horror comedy, “The Dead Don’t Die.” The clip features Murray and Driver as police officers alongside Chloe Sevigny who discover that their small town is being overrun by zombies. The trio notice that the zombies gravitate towards things they used to do as humans including playing tennis and drinking alcohol. Tilda Swinton also appears as a mortician who is handy with a samurai sword. Selena Gomez, Iggy Pop, Steve Buscemi, RZA, Danny Glover, Caleb Landry Jones, Rosie Perez, Sara Driver, Carol Kane and Tom Waits round out the rest of the star-studded cast. “The Dead Don’t Die” is set to arrive in theaters on June 14th.